Hot Springs, Va., (January 22, 2017) — This past weekend, MB Contractors’ Executive Vice President, Mike Cagle, transitioned from Chairman to Immediate Past Chairman of the Associated General Contractors of Virginia. 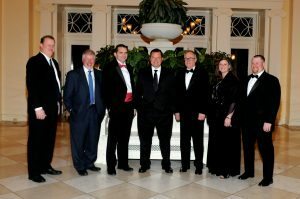 The event took place at The Omni Homestead Resort as part of the AGC Annual Convention. As Chairman, Mike assisted in the transition of the new AGCVA CEO, Gordon Dixon, signed a strategic partnership with Virginia Occupational Safety and Health to protect workers and provide extra incentives for AGCVA members, and has increased overall membership for the first time since the recession. MB Contractors’ executive management team also attended the conference and are pictured with Mike in the attached photo. 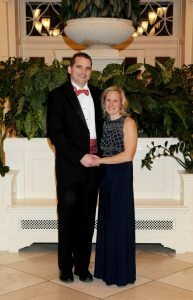 Mike Cagle, AGCVA Immediate Past Chairman and his wife Andrea attend the recent Annual Conference at the Homestead. 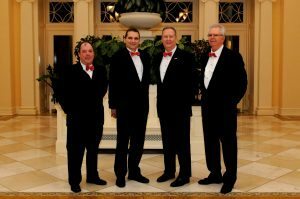 Appearing left to right are Ed Bowman- Current AGCVA Chairman, Mike Cagle- Immediate Past Chairman, Robert Lee- Vice Chairman, and Bruce Tibbetts- Vice Chairman Elect at the Annual Conference recently held at the Homestead.